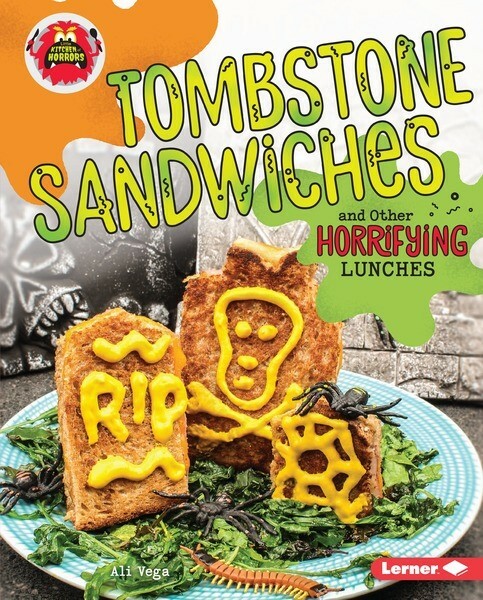 I love to bake, so I was thrilled to edit the Little Kitchen of Horrors series, a set of cookbooks that include deliciously disgusting foods, kid-friendly step-by-step instructions, and fun suggestions for displaying these dishes (because we all know that presentation is important—especially when you’re trying to gross out your guests). 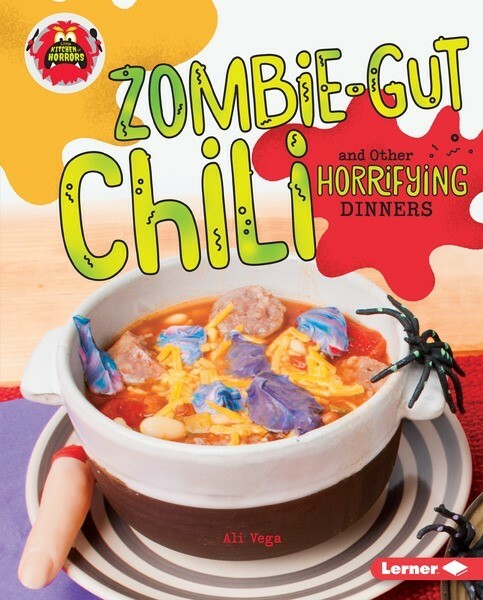 While these books will be fun for kids year-round, I was inspired to try my hand at a number of recipes over Halloween. I’ll admit that some of my creative endeavors turn out more “Pinterest fail” than Pinterest, but these easy recipes turned out to be hits. I’ll share with you one of my favorite recipes from the series – Cat Litter Cake. Be prepared to get some giggles when you present this dessert to your guests. 1) Preheat the oven to the temperature on the cake mix packages. Make both cakes according to the package directions. When they are done baking, let the cakes cool. 2) Whisk together the pudding mix and milk in a bowl. Then chill the pudding in the refrigerator for 10 minutes or until the pudding is thick. 3) Put two handfuls of cookies in a blender, and blend on the low setting until the cookies are crumbled. 4) Crumble the cakes into a large bowl. Add in half of the crumbled cookies. Mix in the pudding a few tablespoons at a time until all the crumbs are combined. You may not need all the pudding. 5) Put the Tootsie Rolls in a microwave-safe bowl. Microwave them on high for 15 seconds at a time. Stop when the rolls are easy to bend, but not completely melted. Then shape the Tootsie Rolls into poo-shaped pieces. Be careful! The Tootsie Rolls may be hot. 6) Transfer the cake mixture to a serving dish or bowl. Arrange the Tootsie Rolls in and on top of the cake. The sight of this crumbly cake may make some guests gag, but the taste will leave them wanting more! 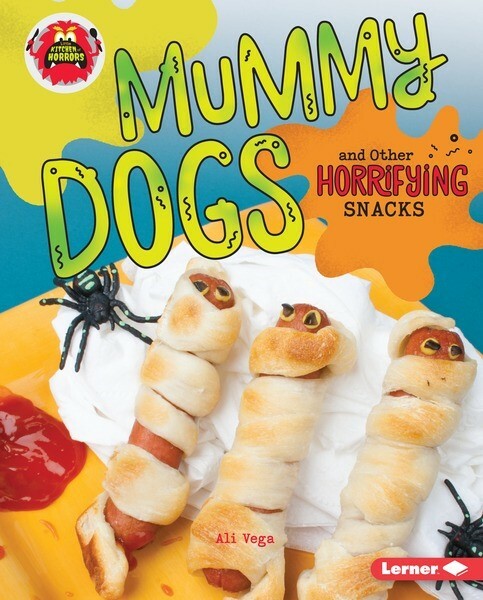 Two other recipes I tried were Sweet Cake Eyeballs and Mummy Dogs. 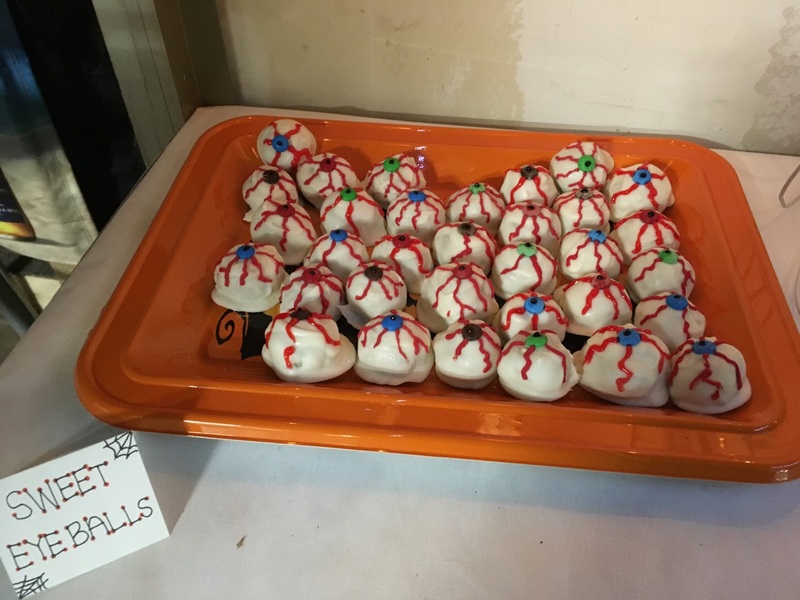 The Sweet Cake Eyeballs were very popular (as cake pops usually are) and were tons of fun to decorate. 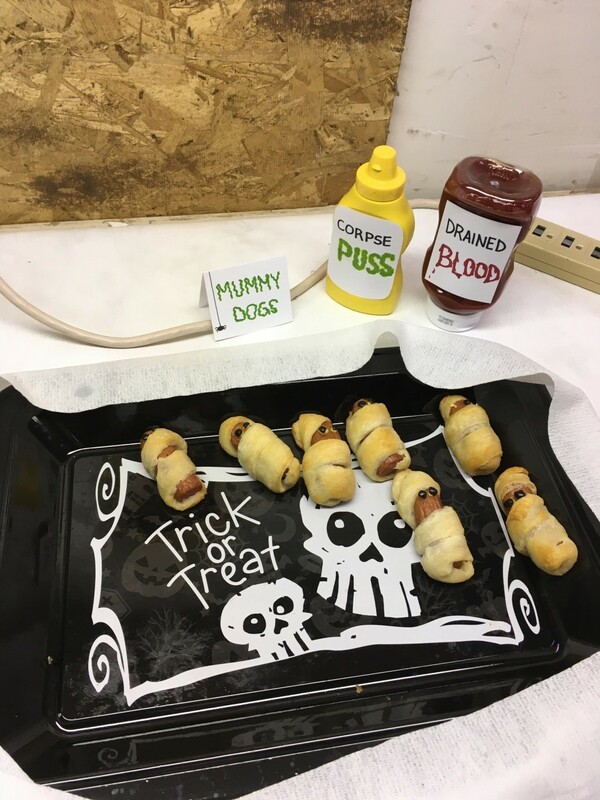 The Mummy Dogs didn’t turn out quite the way I’d envisioned them and mine ended up on the rather derpy side, but that didn’t stop them from flying off the platter! Naming your creation and displaying it in a creative setup are always part of the fun! I can’t help but think they turned out looking like Mama Odie from Disney’s The Princess and the Frog. 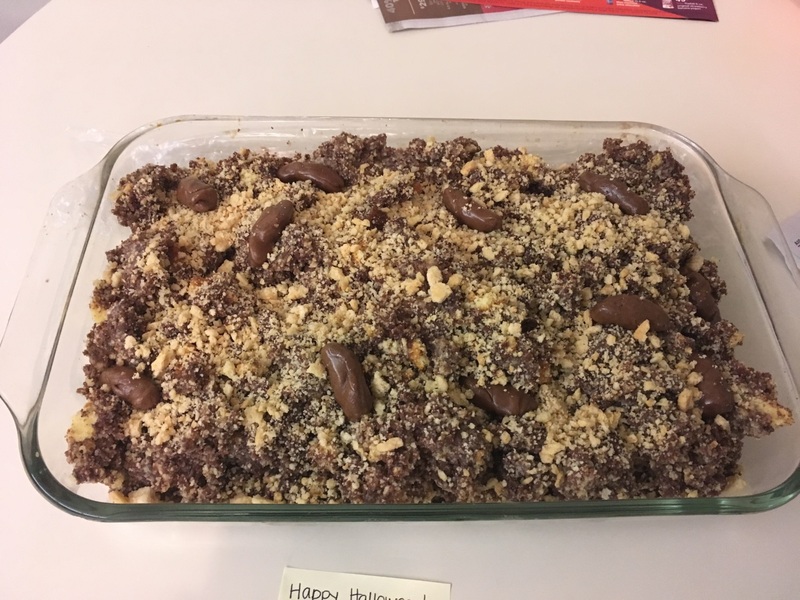 The Cat Litter Cake recipe comes from Cat Litter Cake and Other Horrifying Desserts, and the Sweet Cake Eyeballs and Mummy Dogs recipes come from Mummy Dogs and Other Horrifying Snacks. Click here to check out the entire Little Kitchen of Horror series. Let us know which recipes you try and how they turn out! Do you dare take a bite?